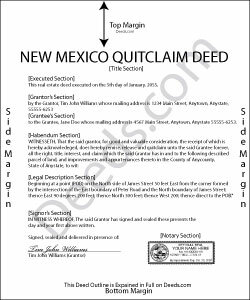 In New Mexico, real property can be transferred from one party to another by executing a quitclaim deed. Quitclaim deeds are statutory under NMSA 1978 Section 47-1-44(3). Quitclaim deeds offer no warranties of title and provide the least amount of protection to the grantee. They do not guarantee that the grantor has good title or ownership of the property and only transfer whatever interest the grantor may have in the property at the time of execution. They are typically used in divorce proceedings or other transfers of property pursuant to court order, or to clear title. All transfers require a Real Property Transfer Declaration Affidavit, which details the sales information for the transfer. There are certain exceptions, such as an instrument delivered to establish a gift or a distribution, or an instrument pursuant to a court-ordered partition. If the transfer is exempt from the affidavit requirement, detail the reason why on the face of the deed. See NMSA 1978 7-38-12.1(D) for a list of exemptions. This affidavit must be filed with the assessor's office within 30 days of the deed's recordation. This article is provided for informational purposes only and is not a substitute for legal advice. Contact an attorney with any questions related to quitclaim deeds or transfers of real property in New Mexico.